You are here for a reason and I think I know this reason quite well. Don’t get me wrong I don’t want to sound arrogant, I have just been in your shoes. Let me guess: you are sitting in your office and surfing the internet, daydreaming of your surf holiday in Bali. Or even better you made it, you are here and want to try a bit of surfing. After all, you are in Bali: the mecca of surfing! So what is the blog about and who am I? And why these two are related? But first thing first. This blog is about SURF and BALI LIFE through the eyes of a ‘bule’ (slang for foreigner in Indonesian). And yes you guessed right, I am the ‘bule’. The reason these two are related, is because I want to present you SURF and BALI LIFE through my personal experiences. Though I ended up living here, I started off as a tourist, exactly like you. Before settling here, I was fully Westernised, not the surf pro or beach bum you might expect. In fact, I am still crap at surfing. First time I came to Bali was in 2012. I couldn’t convince any of my friends to come so I decided to travel alone. I booked my ticket in late September for five weeks. To be honest I was excited but also terrified. It was my second time traveling alone and I was scared, scared, scared. The first thing I remember from Bali was the smell of the scented sticks in the airport and the big sign about drugs being illegal. For the first three weeks, I stayed at a camp in Canggu, where I met some amazing people from all over the world including Indonesians. 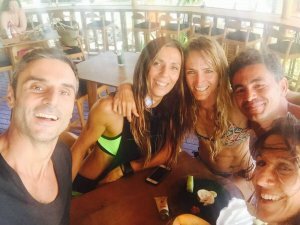 The surf guides helped me a lot with my surfing and I had some very good sessions. 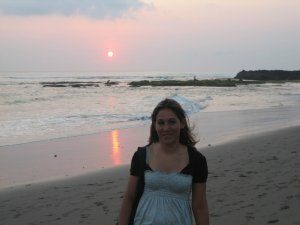 This is me in Batu Bolong beach watching the sunset. Really happy to make it to Bali! Then once I got a bit the hang of it, some friends of friends – I barely knew – happened to be in Bali, we rented a van and traveled around. We surfed, ate, surfed, ate and slept. That was the programme. Well there were some crazy nights out that ended in Kuta but only once – err – a week. I loved every minute of my holiday in Bali and (as it usually happens when you have fun) time passed by so quickly and it was time to leave. It was then that I promised myself to come back! And I kept my promise. I came back a year later in 2013. But this time I had less time (or that’s what I told myself). I booked my ticket to stay over for three weeks to surf, surf, surf. After all, coming from Europe, I really missed the Indo waves. And yes I made it for the 2nd time! 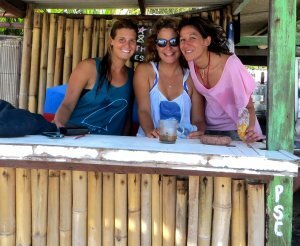 Big smiles after a surf session with two good friends! And then to make a long story short: I met somebody, fell in love (yes, usual story here) and three weeks became three months! …Thank god I could do some freelance work that saved me from bankruptcy. After changing my tickets two times, I ran out of excuses and had to return home. I didn’t want but had to. Back in my country, I was constantly thinking of Bali. After just two months, I couldn’t resist the temptation. I booked these tickets again and came back. But this time with no return ticket. And here I am, still in Bali, and still unable to realise how things changed so drastically in my life. Me today. Same same but different! At Berawa beach with some friends over from Greece. Well I hope I didn’t bore you too much with my story. This is the first and last blog entry where I talk about myself. I just wanted to show you that some things just happen…So if you are in Bali, make sure you enjoy yourself to the maximum and make no plans. And since I am here, let me give you some good stories and tips of how to maximise your surf holiday while in Bali. If you are still unsure and thinking of it…Stop thinking, book these tickets and come experience for yourself what Bali is all about!